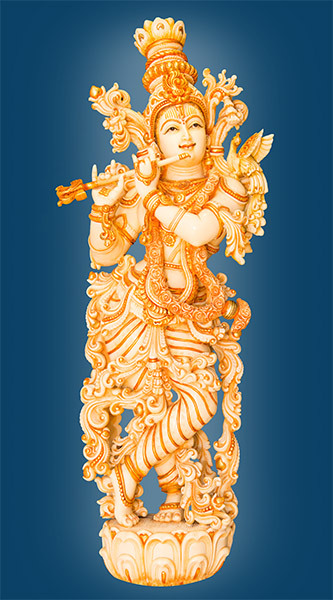 A child, a brother, a charioteer, a warrior, a disciple, a guru, a cowherd, a messenger, the beloved of the gopis… Throughout his life, Krishna enacted so many roles—the whole time never forgetting that they were just that, roles, and that his true nature was eternal, ever blissful consciousness. In this way, he was able to remain detached and thus perform flawlessly, never allowing the smile to fall from his face. 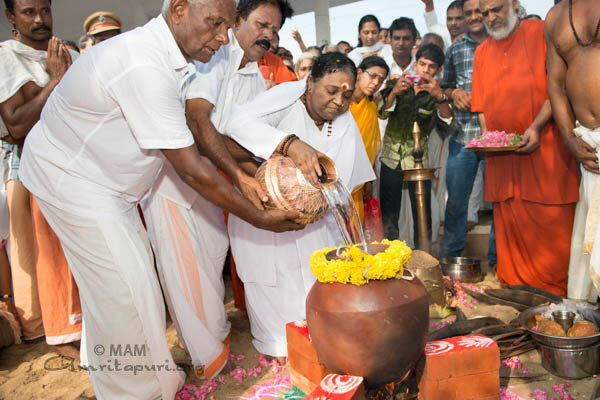 This, Amma says, is perhaps his greatest teaching. 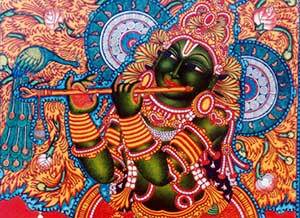 Krishna’s life was so full, it would be impossible to recount it all here. 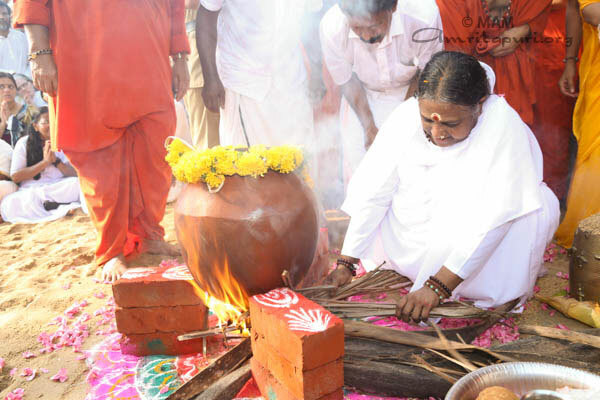 It is told primarily through Srimad Bhagavatam, Garga Samhita, Visnu Purana, Brahmavaivarta Purana, Mahabharata, Harivamsa and several other puranas. However, here are some of the broad strokes. Krishna, in fact, took birth in a prison cell. A sage had told his egoistic uncle, King Kamsa, that he would be killed by his sister Devaki’s child. So Kamsa imprisoned Devaki and had each child she bore murdered. However, Devaki, and her husband, Vasudeva, finally were able to sneak one child off to safety. This was Sri Krishna. 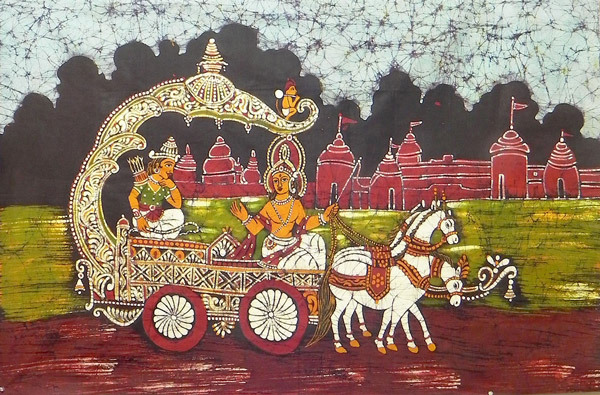 They sent Krishna off to Vraja, where he was raised by a foster mother, Yasoda. It was in Vrindavan, one of the villages of Vraja, that Krishna won the hearts of the gopis, the cowherds of the village. 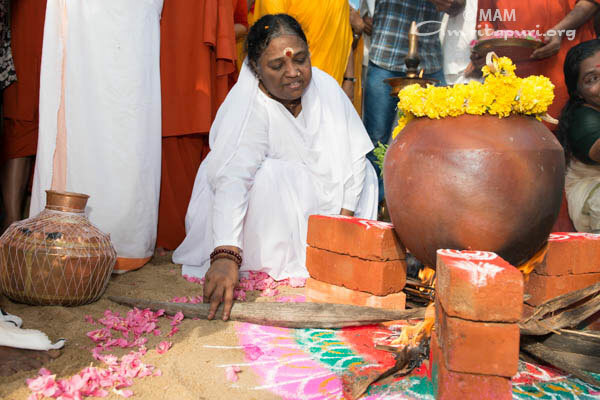 “By spending all his time with the gopis of Vrindavan—playing with them, joking with them, stealing their butter and milk, etc—what he actually was doing was stealing their hearts,” Amma says. It is from this that Krishna was given the name “Chitta Chora” [one who steals the mind]. Kamsa sent many assassins to kill Krishna, but none of them were able to do so. And in the end, Krishna returned to Mathura and killed Kamsa, restoring dharma to the land. In fact, Krishna never returned to Vrindavan. The pain of separation was unbearable for the gopis. 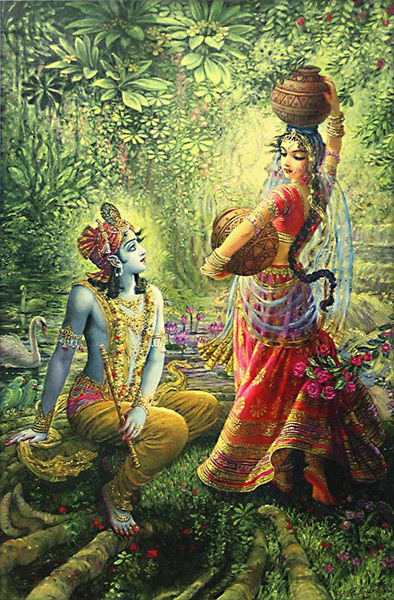 It drove their minds into a fever pitch, wherein their every thought was of Krishna. Through this, their minds were purified and they slowly became able to see their Beloved in all things: in the trees, in the rivers, in the mountains, in the sky, in all people, and animals—even in their own selves. This was the realization that Krishna had intended to bring about within them from the very beginning. Lord Krishna left his physical form at 125 at the hands of a hunter. But he died as he was born and as he lived—with a beatific smile upon his face. In fact it is said that his final act was to bless the hunter who had accidentally shot him. Such was his love. 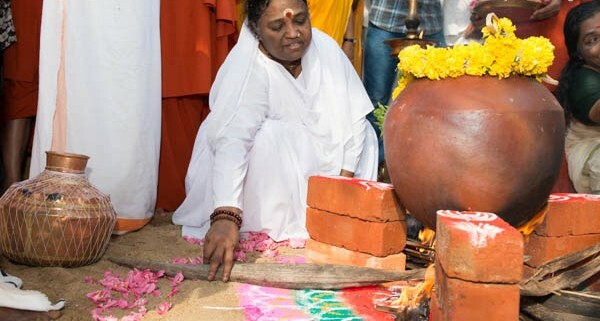 Garga muni performs the naming ceremony and names the baby as Krishna.